Congress was not able to #FixTheCliff prior to the September 30th fiscal year end. Because we are funded on the calendar year, health centers now have only 90 days before the 70% cut becomes a reality. Our dedicated advocacy over the past months has gotten their attention and a "mark-up" has been scheduled in the Energy & Commerce Committee - the first step in getting to a solution. But we can't let up now! Please keep fighting for health centers and the patients they serve in your communities. Contact your Member of Congress and request a bipartisan solution to the funding cliff for health centers, CHIP and the NHSC in October. Please take action! Let your elected officials know we need a bipartisan solution for health center and safety-net funding now! As a constituent of your district, I am writing to ask that you please work with your colleagues to find a bipartisan solution for health center funding by the end of the month. 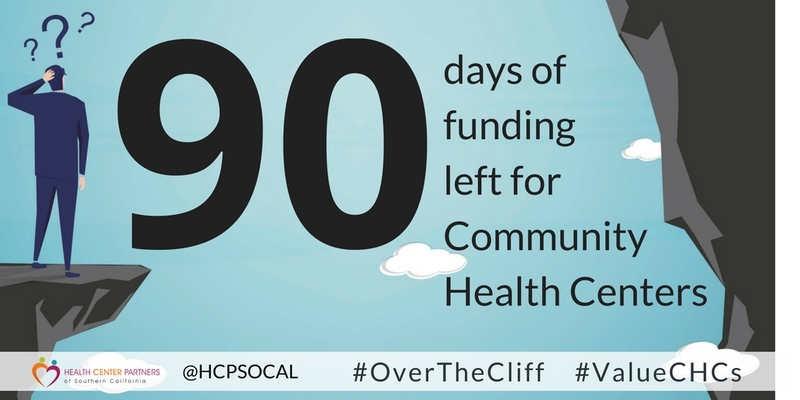 Community Health Centers have only 90 days of federal funding left before facing a 70% cut in funding. This uncertainty is already creating challenges as it pertains to recruiting physicians and other workforce, implementing needed services and long-range planning. In Southern California, our community health centers provide access to high quality and affordable medical, dental and behavioral health care to almost one million people in over 130 delivery sites. Nationwide, 27 million people call a community health center their medical home - or 1 in 12 of all Americans! For more than 50 years, the health center movement has had strong bipartisan support from Congress. The investment is working! Please don't stop now. Please urge your colleagues to work together for a permanent, long-term, bipartisan solution to health center funding by October 31st. Our communities and our families are depending on you. Thank you for speaking up for the patients served by community health centers. Your support makes all the difference in making our case to Congress. Don't grow weary! Please encourage others to act by sharing on social media or forwarding to your friends and colleagues.